On Friday 26th July 2013, Mark and Kelly said their vows and tied the knot. 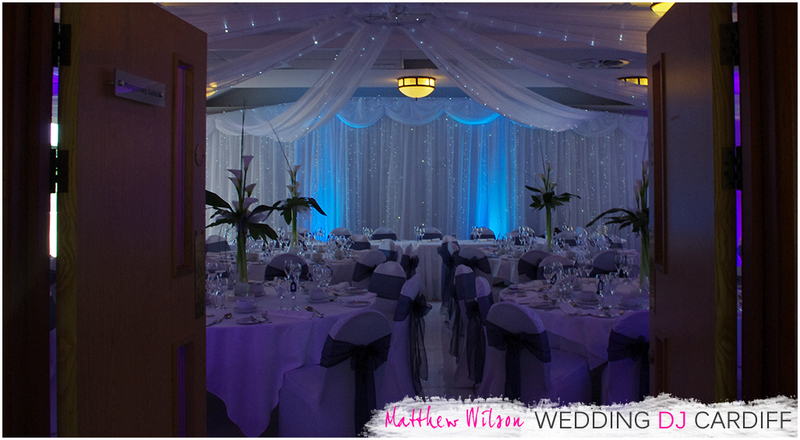 The wedding reception for the new Mr and Mrs Quarini was held at the lovely Vale Hotel in the Vale of Glamorgan. Throughout the morning of the wedding, me and my team set about transforming the Morgannwg Suite into something that looked unmistakably wedding themed. 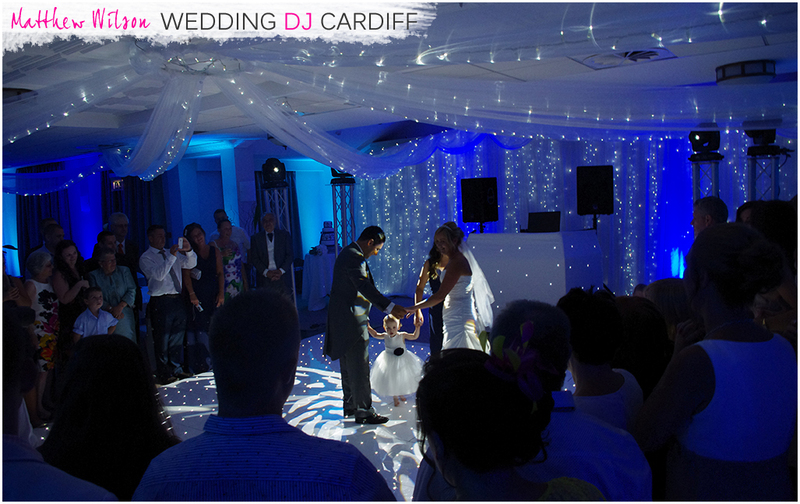 We set up the white starlit dance floor first, along with the starlit backdrop draping, I then positioned the 18 mood lights around the room to make a dramatic colouring effect. Lastly was the set up of the DJ booth at one side of the room to supply the guests with background music for their wedding breakfast and wireless microphones for their speeches (which actually came before the wedding breakfast). Guests arrived at the Vale Hotel at 14:30 and were treated to a drinks reception in the bar directly below the Morgannwg suite. At 16:15 guests were led upstairs to their seats, leaving just the bride and groom downstairs so that they could make their grand entrance. I coordinated the entrance with the very helpful Nicole, who was overseeing the running of the wedding throughout the day (and most of the evening too). As I asked the guests to rise for the arrival of the bride and groom, the doors were opened and in came Mark and Kelly. Once all guests had re-seated, the speeches began with Clive (father of the bride) going first, then Eddie (best man) and finally Mark. The speeches were well planned and all of them had the guests laughing. Once they had concluded, I left the guests to enjoy their meal and background music while I retired to begin organising the evening disco lighting system. From a supplier perspective, the Vale Hotel is perfect as there is easy access to all rooms and suites. Some venues have multiple flights of stairs, which is certainly not heavy equipment friendly. After the wedding breakfast, guests were asked to leave the room for more photographs which were being taken by 1st Choice Photography and some ice cream being served by Icicle Tricycle Wales. During this period, I cleaned the dance floor and with the help of the staff, moved the DJ booth to where the top table had originally been – in front of the starcloth. 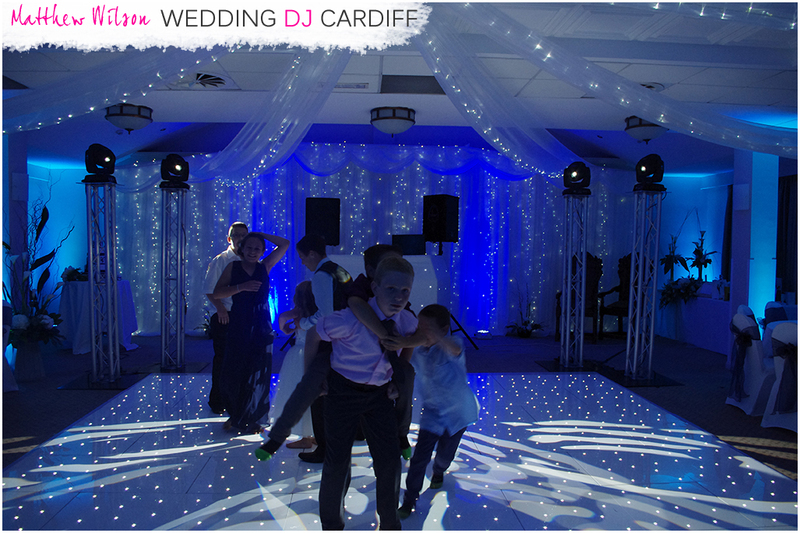 I then also set up the disco lighting and tidied up all cables so that the room remained looking beautiful. When the guests re-entered the room, the children immediately took to the dance floor to show the adults how it’s done. The first dance was beautiful and it was immediately followed by the evening buffet which was being held in the Dyffryn Suite. The spread was brilliant and the guests soon made short work of what was on offer. The music continued and guests let their hair down. The party went on until just before 01:00, with the disco being due to finish at 00:30, this meant several “last song” announcements were made. It was a first for me having guests chanting “Bieber”, but it certainly went down well. All the best to Mark and Kelly, thank you for making me part of your very special day.